Summary: A secret that is well known to Crossfit enthusiasts is that a padded weight vest can add some serious extra intensity to your workout. The popular XTR Weight Vest from We R Sports allows you to add between 5 and 30 extra kilograms to your upper body. This can be used while circuit training, running or for general body weight type exercises. That extra weight increases the intensity of your workouts – with big benefits for the results you’ll see. These vests are reasonably priced for the extra boost you’ll get, and the weight is adjustable. See the colour and weight choices for yourself over on the dedicated amazon.co.uk product page. Bags of sand are the key to the adjustable weight levels in this vest. The design is a nylon sleeveless vest with Velcro straps to hold it in place. There are narrow slats covering the vest. You insert as many or few of the mini-sandbags into these as you like. When you choose your vest, you can get between 5kg and 30kg of these weights to go with it. I recommend you go with a little more weight as a default. You’ll then have the opportunity to add extra weight as your performance improves. If you have too few, you could find yourself with the hassle of ordering more at a later date. This weighted vest is one size fits all. Comments from different sizes of users bear this out. Smaller fitness fans might need some comfortable clothing underneath or even some light padding. Note that in addition to the best-selling XTR Weight Vest, there is a limited edition ‘designed’ one. There are only 600 of these, so you’ll need to be quick! You can find out how many are left on this separate amazon.co.uk product page. Overall the comments for the XTR vest are positive. More than 100 of the 119 comments (at the time of writing) gave 4 or 5 stars. With only a single buyer giving the minimum! Themes that run through the comments include validation of the ‘one size’ claim. The ease of adding and removing the weighted sandbags is also mentioned by several separate buyers. Some people shared concerns that this vest would not last for ever. Having said that I did not see anyone say that it came apart or failed in any way. The prompt delivery and pro service from We R Sports also came in for some praise. This company supply a lot of home fitness equipment and accessories – and are generally well regarded by their customers. 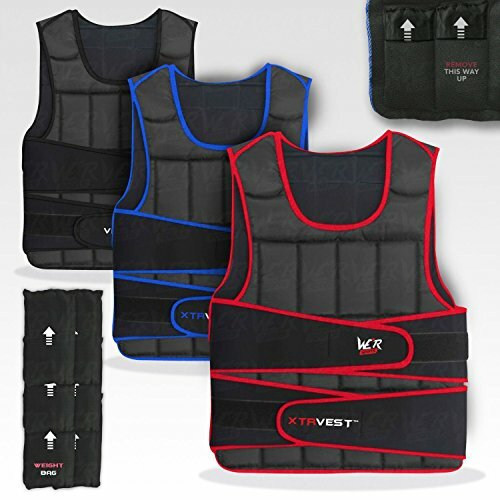 Wrapping Up: Is the XTR Weighted Vest the Best Weight Vest? Adding extra body weight can give your workout an intensity boost. This will be apparent in your results very quickly. Not only will you burn more calories, your muscle and tone will reflect that extra effort too. What I liked about this vest is that you can adjust the weight as you go. If you go for the 20KG version, you can start at 8 (just one example!) and then add a kilogram a week until you hit that target. This works for Crossfit, Running, Circuits and general body weight exercises. Check out this dedicated amazon.co.uk product page and read the feedback from previous buyers for yourself! More Cool Accessories to Check Out!